This is the Olympic Plaza ice skating rink downtown in Calgary. I took this around 1pm on Monday and as you can see there wasn’t a lot of people there. This might be an ideal time to do some skating if you’re looking to avoid crowds :). It’s a nice setting right downtown and the subway stops pretty much right across the street. I might have to make my way down there with my skates one of these days. 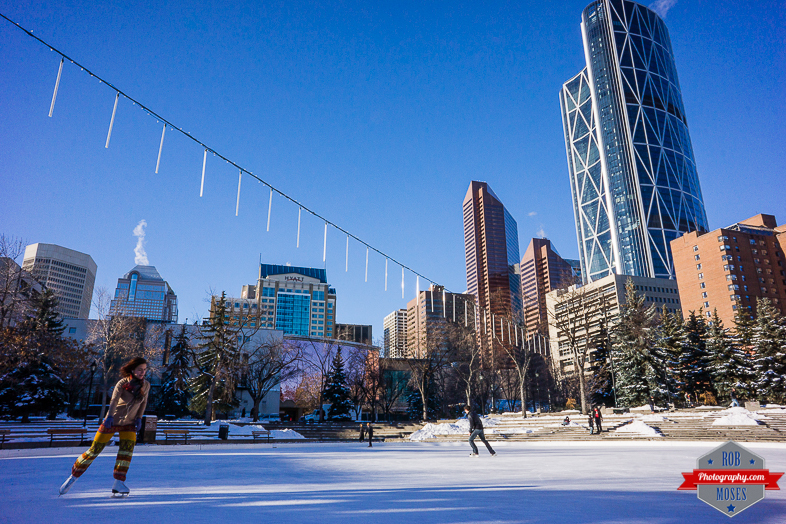 This entry was posted in Architecture, Cities and tagged 16mm, Alberta, beautiful, building, buildings, Calgary, Canada, city, City Life, condos, ice, ice rink, Ice skating, man, metro, mirrorless, NEX-7, nex7, Olympic Plaza, Park, photo, Photography, pretty, prime, public, rink, Skating, sky, Skyline, skyscrapers, sony, street, tower, Urban, winter, woman, yyc. Bookmark the permalink. great perspective and great use of the wide angle lens. Nice to see the sun is shining in Calgary. This is a great place to take the kids on the weekend, if I rememeber correctly there is a drink and snack stand in the northe east corner of the plaza. We have a similar place downtown Oslo, but it’s usually crowded with kids and tourists and the ice is crappy. I guess that it’s better in the daytime during the weekdays. Ice skating is a lot of fun!